Nous avons le plaisir d’annoncer la tenue d’un colloque international à l’University of Surrey intitulé « London and Paris, capitals of the foreign language transnational press, 19th-20th Centuries » (Londres et Paris, capitales de l’édition de la presse étrangère transnationale, XIXe-XXe siècles »). Constance Bantman, membre du réseau AsileuropeXIX, est à l’origine de ce colloque. 10-10.30: Colette Colligan (University Simon Fraser, Vancouver, Canada), The English-language press in fin-de-siècle Paris. 11-11.30: Bénédicte Deschamps (UniversitéParis VII), The press in Italian in France, 19th century. 11.30-12.00: Andrea Del Corno (London Library), Press in Exile: Mazzini’s Journalism and his Intellectual Legacy (1840-1859). 13.30-14: Victor Pereira (Université de Pau, France), The Portuguese Press in France (20th century). 14.00 -14.30: Daniel Mandur Thomaz (University of Oxford), ‘Transatlantic networks: Brazilian intellectuals and war correspondents in the BBC Latin American Service during WW2’. 14.30-15.00: Daniel Laqua (Northumbria University), ‘‘A connecting link between the workingclass movements of both sides of the North Sea’? The German socialist press in London, 1886-1909’. 15.00 –15.30: Camille Creyghton (University of Amsterdam), The German exile press in Paris, 1830-1848. 16.30-17: Concluding remarks by Laurel Brake, Professor Emerita of Literature and Print Culture, Birkbeck, University of London, ‘Media History: Re-defining ‘the press’’. 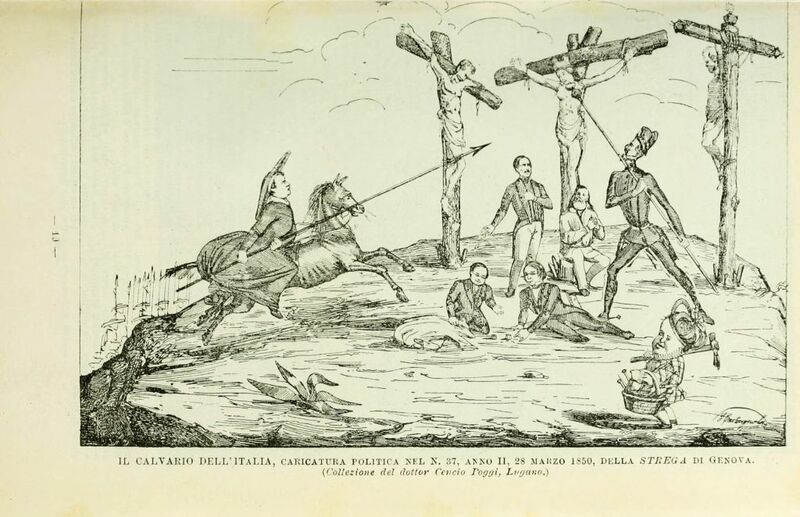 Vision satirique de la situation politique italienne, le 28 mars 1850 signée Gabriele Castagnola et publiée dans le journal de Mazzini, La Strega.